Leading business VoIP platform offers a plug-and-play service that runs on your high-speed internet. You get 40+ business-critical features, mobile integration, and built-in collaboration tools with Amazon Chime Pro. Activation is easy, no onsite installation is required, and month-to-month contracts are available. And the service is backed by a full team of Vonage Business service and technical professionals. Vonage Business Reviews Recently Reviewed! Comments: I am overall satisfied with Vonage Business Support- each time I called on the phone I was given a real person to speak with and a case number, to ensure the quality of my "case" the next time I called. As a busy work professional, I found this very valuable. I spoke to an amazing tech after speaking with Vonage Business support. He was able to direct me to exactly what I was looking of in a very short amount of time. My business purchased over 10 lines and the Yealink T46G phones from Vonage. I find these to be incredibly professional phones with a large screen. This is extremely beneficial when I am wearing a headset, on the regular phone, or connected with m work cell. Pros: In regards to Vonage Business Phone systems, I like most being able to speak with a real person to answer my questions. Help was available any time I called. The help was organized and true- this helped me weed out things I didn't have time for. As a busy professional, this was extremely valuable. Each person I spoke to was able to help me validate my "silly" questions and assist me through the Vonage experience. The Yealink also shows busy field lines, my favorite feature on the phone, so I can see who, in my offices, is on the phone. This saves me time. Cons: I was disappointing that it took so long to find an associate that could answer my questions. I called three times previous with questions about the phone system, and on the third time I spoke with a very knowledgeable professional who could fully assist me with my system questions. My business has purchased Yealink phones and is disappointing that each phone requires a special Yealink donagle for the "Tested headset list compatible with Yealink IP Phone". While the Plantronics Voyager Legend came with a dongle, we had to order separate dongles for each phone. Recommendations to other buyers: When considering this product, determine if you want excellent customer service and a great product. The Yealink phones from Vonage and the Vonage Business Solutions seemed difficult to understand in the beginning, however as we spoke with the third gentleman, who was an origional tech, the phone and system became a very comfortable and simple system. Comments: If you are starting out or if you are an established company, we have found this to be the best option out there. We have tried Xfinity and several others and only found them to be hard to work with and or lack some of the main features that vonage offers. Pros: There are many pros to the Vonage system. For us we have offices in different states, so when we have patients calling one office and need another we can transfer them as if we were in the same office. There is also the ability to set up a Virtual receptionist so that your company can seem as if it is a much bigger office giving your customers comfort. You can set up a 800 number as well as faxing all in one place. Very user friendly compared to some of the other IP options out there. Cons: Setting up the system can be a little time consuming, but well worth it once it is complete. As will all IP phone systems you need to have active internet for the phones to work. If you lose internet due to a storm like we have in the past, your phones need to be routed to another phone like your cell phone to receive calls. The positive is that the system allows this to be changed via the app on your phone so this is just a minor bump in the road. Pros: Vonage Business has most definitely saved the day for my organization on numerous occasions. Because we work out of many remote locations, Vonage has enabled to have the reliability of a telephone connection at a much more affordable price than the phone company. Also, in the public safety field, we have to mobilize resources to a lot of different places where we can't have the benefit of connecting to our operations bases with a landline. With Vonage Business, all we need is an internet connection and we are ready to do what we do best: provide fire protection and EMS. Also, Vonage Business has helped us tremendously with routing calls to the proper specialties of our organization. Cons: The thing I like least about Vonage Business is the lack of a feature where I could type in a message and the auto-attendant would automatically be created in a pleasant sounding voice. Currently, we have to create our scripts in another program and then import the audio file into Vonage Business. Overall: Vonage Business has helped us increase productivity as well as provide critical services to our constituents. Comments: Vonage Business Solutions is one of the reputed service providers for VOIP requirements, there is a vast array of plans and services to choose from, as per an individual's requirements. 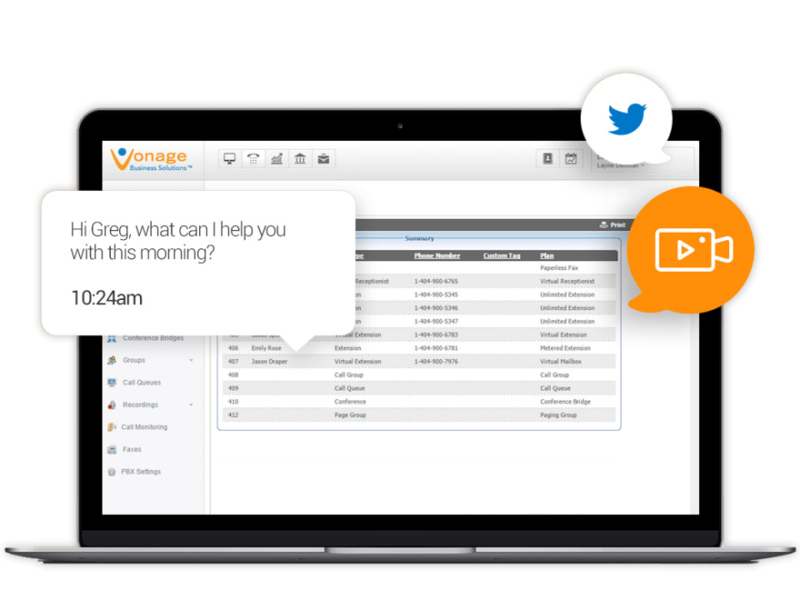 Now Vonage may be used from Desktops, Laptops, Tablets, Phablets or smartphones too via mobile app. The customer support is efficient and hence one may not be stuck with an issue for too long. There is transparency in service and charges due to monthly pay-as-you-go business model. I will recommend using Vonage Business Solutions for all these reasons. Pros: Budget VOIP calling plans worldwide. Easy pay-as-you-go business model. Robust Infrastructure, quick and customer friendly customer support. Versatility to use it with various softphones/hardphones. Good Call Quality, Business Reports Functionality, User-friendly UI. One of the oldest brands among VOIP service providers. Cons: Vonage should offer more functionality with standard plans. I wish call recording feature was standard for a user, without incurring extra charge every month. Not many cons which I may think of at the moment. I also faced some trouble with their Vonage Business Desktop softphone, after which I switched to X-lite, which runs lag free with Vonage Business Solutions. Comments: Vonage's apps for computers and phones makes it a seamless extension of my business. Pros: I love that you can forward calls and messages to your personal cell phone, eliminating the need for corporate phones should the company desire. In addition, the desktop app makes it easy to make calls (even international ones) from anywhere. I like the integration of a company's contact list and speed dials for international locations--we have a large presence outside of the US and it's so simple to speed dial to Ireland quickly. You would think a US-based company would have trouble with this, but it's honestly so seamless with Vonage. Our Corporate team is very happy with the services they provide at a very fair price. I really appreciate how Vonage makes our workflows easier and more efficient. Cons: I wish that the features of calling a number directly from your computer were better, but honestly that doesn't impact my job too much. There are no major cons for me. Pros: Software if very easy to use. My overall experience has been good with the software. Pretty self explanatory when it comes to overall review. Drop down selections and menu boxes are easy to understand. Cons: Found the online phone function or app a little cumbersome. Still a few bugs to work out. I have tried a couple of times and it eventually will be the right route to go with business and functions. I am a little old school . . like the phone on my desk and answer it like a normal. So maybe its the old dog new trick thing . . . I just will keep trying and hopefully it will be just right soon. Pros: 1. Easy to understand and work with. Cons: Some times, there is an issue for call drop. But it is minimal and happens due to poor internet connections. Pros: I like the ease of not having a physical phone that can be a hassle when traveling. We use this in our customer service call center and it allows multiple users to log into a queue and manage calls accordingly. It handles call recordings as well which is great for quality control. Cons: Their system goes down every now and then, outages that has costs us a few customers. We then have to revert to your mobile phones to make outbound calls which is very inconvenient. Overall: We have been utilizing their service for over 6 six years and it's a really good value for your money considering everything that you get. If you're looking for ways to reduce costs, switch to VOIP with Vonage Business so you don't have to keep buying expensive desktop phones and headsets. Pros: We've been with the service since it was Vocalocity and compared to other VOiP telephony providers, their software and support was superior especially when you look at the price. Now there's more parity in the market place but at the time, it was a huge gamechanger for us, since we couldn't afford a traditional PBX. The support team is U.S. based and the call center is in Georgia. They've been nothing but friendly and actually helpful. This is crucial since VOiP is a very advanced, technical type of service. Cons: VOiP is what it is. It's dependent on both your internet service, the connection to their servers, and their servers themselves. Occasionally their service is down, occasionally the call quality is poor. Sometimes it's on their end, sometimes it's local. You're just not going to have the quality consistency of a regular telephone line. That being said, the features that you get with VOiP balance it out. Recommendations to other buyers: It depends on what your needs are. If you need a more sophisticated, multi-extension, phone system then VOiP is the way to go in terms of cost and value. Vonage Business Solutions is an industry leader with a full featured platform and a great support team. Pros: I've been using vonage for my business for the past 6 years. I started using them in Canada and liked them so much that they were the first company I thought of when I relocated to the States. I like that they give their customers great introductory offers at the start. Thereafter, the rates are fair from year to year. If you want to keep the same rate, all you have to do is let them know of a better offer you have received elsewhere. I bet you they try to match it just to keep you. I love em. Vonage is here to stay. Comments: You will definitely get more bang for your buck with Vonage Business and you still get all of the features. Pros: Having the ability to forward your work number to your personal phone is a great feature. You also have the ability to make calls from your personal phone while your work phone number shows up on the recipient's caller ID. There are conference call options along with the mobile app options that will keep you and your team connected from almost anywhere. Cons: The connection is internet based so if you lose power or your internet goes down, you have no phones. Comments: I have a company based in the united states but I live abroad. Vonage has made it possible for me to stay in contact with my American clients without them even realizing i'm not in the country. Pros: Voice to text feature is very important to me as I'm not always in the correct setting to listen to the messages we receive. It's fairly accurate and only seems to have issues with certain accents. The fair pricing and excellent customer service makes Vonage the choice that you are sure to pic. Cons: At this pricing and the quality of the service, I have no cons. Comments: Great IP Phone Product! We highly recommend it! Pros: We had a Vonage Business Solutions IP Phone for about two years for a home office job and absolutely loved it. The price, incredible! The power and the capabilities also exceptional. This is an incredible solutions for a home office environment phone that is cost efficient and easy to use! Cons: None! We really liked this phone system. We thought the connection may not be good due to being an IP phone, but we had no issues whatsoever. Thank you! Comments: Great to have Vonage. Pros: I have been using Vonage from last 5 years. Its a great think for International calling. The Vonage Mobile Application also do the similar Job. Vonage call quality are really good and the cost of using Vonage is very less. Call forwarding feature really works well. The voice mail are converted into text and sent on your email id is the best feature i like. Cons: i didn't really found any cons in Vonage, but the application of Vonage of phone something Lag a lot. Pros: I used to carry two cell phones - one personal and one business. Then I got vonage and now I can answer (or not) business calls from my personal cell. I can also send a patient a quick text if I'm not available to my scheduling webpage. Pro tip: if you have an iPad, you can create keyboard "text replacements" in settings and with a couple of click, you can generate responses to customer calls or texts when you are away from the office. Cons: Now cons so far. Every once in a blue moon the app will kick me out and want to me renter my password which I can never remember but that's not their fault! Pros: This app helps all the people to access their vonage account at home also because many people from India also uses this app mostly recruiting companies. The app has a great UI which attracts the users to use it on daily basis. The great advantage using vongae business app on phone is that we can read the messages if someone texts us because in the office on dialer phones its not possible. I really Enjoy using Vonage Business which give us great advantage to connect to people sitting abroad from India. It has a great Voice quality(HD Quality) and we can hear it very clearly very easy to use and options are very easy to handle. Cons: what do i like least about it? Its the issue of voice breaking sometimes i understand that there is network problem but when i have a great network then also i face this issue. The names that appear when we receive the calls is not the name of the person actually calling us. This is the main issue i face. Overall: Great product for connecting the people. Helps us lot in the business. We want to use it in future if the cons above are are solved at least 50%. 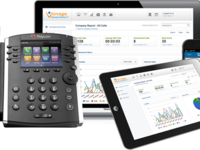 Pros: For a new business or a smaller organization, Vonage is a great solution to get a centralized phone system VoIP set up. The app is great too! Cons: The support can be a hit or miss and if you run into issues you have to deal with it. Although quality is usually great quality, it can also all depend on your overall internet connectivity which makes it hard to diagnose where the issue is if you start experience call drops or bad quality. Comments: Voice quality is adequate. Pros: The web dashboard is really comprehensive, you can control almost every aspect of the service. If required, advanced features like call queues can be added to the service. Cons: Reliability has not been their strong point, with outages that have lasted for hours. There is an online health check site for the service where admins can check status of the Vonage cloud. Price points are not among the cheapest. I love the easiness of using Vonage Business. Pros: Voicemails are easy to access when not in the office, they also get sent to the company e-mail if nobody answers. Easy to set up phone numbers through the app on a mobile phone for usage of number during off hours out of the office. Cons: It can be a little bit pricey for what they offer but it really is a well built voice software so the price is worth it. Overall: Great communication system in our office with virtually no issues. We update our phone systems to vonage and love it! Pros: We love that you can create a virtual assistant and transfer calls around the office. It helps my small business appear very professional to our clients! Overall: We now have multiple phone extensions and we can all be on the phone at the same time without interruption. Pros: My company recently switched over to Vonage to be our call routing system, and I've personally been a big fan of it. As a vacation rental management company, we need some people to be on call 24/7, some only during the day, some only on certain days during the week, etc. And these people change, week to week, depending on our schedule. It can be pretty confusing, and at first, the Vonage system was not set up specifically to our preferred plan. However, the Vonage support staff was really great in creating a guide for us, and setting up meetings to make sure the system eventually flowed the way we needed it to. Their system is VERY user friendly and intuitive, once you get the hang of it. Everything is clean, the design is sleek, and the customer service is great. What more could you ask for? Cons: Because the calls come over wifi and do not use cellular, the call quality can sometimes be very spotty. Additionally, as I already mentioned, the flow of Vonage can be difficult to figure out at first. A VoIP Solution for Home-based Workers! Pros: Vonage Business saved me and my client hundreds of dollars! I use Vonage to connect with my client, our customers and in all other communication we do as a business. Pricing is affordable for small-medium businesses and to start-up businesses as well. Working homebased had been easier with Vonage. Their customer service is extremely friendly! Cons: It's good that they offer Voicemail Transcription, but sometimes it's not accurate. I had to listen to the voicemail to verify if the transcripted message was correct or not. Comments: I use Vonage Business Solutions and the Vonage Business Essentials App. Both have been great. There was a slight adjustment to using their technology, but it was quick to pick up, and provides a great foundation for businesses that rely heavily on good phone service. With Business Solutions, the service is good, and the website has some great features to track phone calls, including incoming, outgoing, and internal calls. I've been really pleased. I especially think it is a great service for a sales organization. Pros: I really like the Vonage Business Essentials app that pairs up so nicely with the Business Solutions package. The accompanying website is great too. With the app, I can send and receive text messages from the app, almost eliminating the need for clients and customers to use my personal cell phone. And it tracks the data (customers called, messages, etc.) used on my cell and reports them on the site. Brilliant! Cons: There were some initial set up issues, but they were resolved quickly. Now I feel right at home with the product, and it's great. Recommendations to other buyers: Look into it for a great phone service with good features, functionality, and easy to use tracking functions. Vonage is a top communication performer! Pros: I like that Vonage is very user friendly, easy to install and update. Having the ability to send SMS,text message is a great feature. Cons: Sometimes there is too much static or poor call quality. Or the calls will not connect or drop mid call. Not sure if this is due to a bug or internet connection. My organization is currently using 5G internet. Overall: We are closer to having a unified communication tool. The sales team is able to communicate multiple ways to the prospects and customers. Especially having the ability to send text messages! Comments: The price is great for the calling plans, for the US, it includes a 1000 minutes to all U.S. locations. Pros: Very good call quality anywhere in the world, excellent customer support and easy interface to configure. Cons: The Software is not easy to configure if you decide to use an open source solution such as Asterisk. I requires good knowledge for it to get it working 100%. Pros: WOW !! Vonage the beautiful internet phone so far on the market, high Voice quality low distraction. Cheaper rates and faster connectivity. Cons: Nothing to say anything as everything is good about it. Overall: Customer support is very good and the Vonage mobile app lets you text and listen your voice messages. Great work in there team Vonage Good luck !! Pros: The ease of using the system for programming phones, listening to calls, setting up voicemails and entering email addresses. Cons: The explanation of each part of the system is not always clear. For example, the options do not always explain the outcome - what will actually be affected by selecting an option. Cons: The only thing that I would change is the fact that the app for your cell doesn't allow your to hear recorded calls or monitor calls. Overall: Amazing software I love it ! Comments: I have been using Vonage for about three years now. I find the software to be fantastic, however I think they could be a little faster on the customer support side of things. There are many great features such as virtual lines, virtual receptionist for both open and closed hours, run and print reports, send voicemails to emails, transfer calls between phones, send calls to your mobile devices and more! Pros: I love being able to control the entire phone system for all three of our locations from my laptop! I have fixed phone issues while being out of state! You can not get more convenient than that! Cons: Costumer service is slow! Often times you are placed in a que and you have to wait to be called back. Not very convenient when your business's phones are down. That being said the actual staff is friendly and knowledgeable. I also wish they had some better tutorials for all their features. Recommendations to other buyers: This is a great phone system for a small to mid sized business that allows you to track your phone usage per site, per user and the it is extreamly easy to add and subtract lines depending on the flow of your business. Pros: We get clear, phone coverage for our company within U.S and globally. The service has a good voicemail system setup that can be linked to your email account and your phone,so you can call using Vonage when you're not at your desk. Cons: Setup functionality is not the best. It's hard to setup the system initially for new users. Customer service is subpar.They redirect you to online forum so its tedious when there is a problem. Pros: I am currently using Vonage Business as an Offshore Recruiter. I believe the best feature for this VoIP platform is it's crystal clear voice quality. You can never miss a call as your extension can be used in multiple devices. I had it installed on my phone so I can still monitor all calls and texts from my candidates. I love that text messages do not have a character limit. The user interface is also simple and easy to learn. Lastly, it is a big help to see call logs and reports so that you will know your productivity each day. These reports can be downloaded and can be forwarded via email. Cons: I once received a prank call and I tried to block this person's number. To my surprise, I can still receive text messages from him. I do not know if this only applies to calls but I hope they can do it with text messages, too. Overall: I am very satisfied with Vonage Business. Exceptional capabilities for an IP Phone product. Highly recommended! Comments: My company chose this phone system and we are all happy with it. Good choice to keep the communication smooth within a company. Cons: If you're on the phone via your computer and the internet goes out, the call may drop. The software itself requires basic training to use its basic functionalities, but you'll need to take time to learn the more advanced functionalities. Pros: Easy to set up and use, which is important for our remote workers. Good call quality. Easy to set up phone rotations and ringing patterns. Cons: There really weren't any negatives. We left because we found another service with most of the same features but at significant savings. Pros: It's Very inexpensive, You can call many different countries, and it is Easy to retrieve your voicemail. The phone generally works as required. Pros: The ability to forward calls to various locations has been helpful. This was my first attempt at using VOIP. Cons: Customer service is lacking. Trying to transfer the number to another carrier is a nightmare. I have not been able to speak with anyone that can assist. The phones were okay for the most part, but there were too many outages that occurred. Pros: I liked that the phones were simple and easy to use. Also, there was an online portal where I can sign in as an administrator and adjust call flows or make changes to a phone line's settings, which was easy to learn. Cons: Often times, the phones in our office would just stop working. These outages sometimes lasted days and we would end up having to use our cellphones to continue with our jobs. Pros: The ability to get multiple phone lines and use on the same high speed internet we already have at a fraction of the cost. Cons: Nothing with the service it self but since its tied to the internet sometimes the phone quality is not as good. Pros: Easy to use, has good voice quality even in low bandwidth. Mobile app is amazing works on 3g, lte and on WiFi. Messaging features is a good add-on. Configuration is quite easy. Cons: I didn't find any cons in particular, I've been using both landline and mobile app. Maybe sometimes the app doesn't run in background and can miss a call or so but that's very rare..
Pros: The voice quality is great without any call drops. Works as good as normal phone with text features available. The iOS and Android App works awesome. Cons: Not more than 3 people can join the conference on a single line. Cheapest way to call Abroad! Pros: We are international travelers and we usually top up our phones with international calling but it is expensive. So, we thought of getting vonage phone and then downloading vonage app. Using Vonage app is pretty easy more likely i am using a regular phone. You just need to have a really good internet connection. Cons: App crashes abruptly but they fixed that problem in their new versions. Also, it doesn't work sometime showing no internet connection whereas internet is always there. Still no Cons as such which will make you think of why i downloaded this app. Pros: Voice Quality is very good, it has very minimal call drops, Cost effective. Overall: Will recommend this for business, as it is cost effective and very easy to use and install. Pros: They have a lot of good features, more than you really need. It's user friendly, no one in the office had any issues using it. Cons: After setting it up I had to call customer service 8 times before my fax would work. Each time they told me something different and changed the settings. When I told them I was about to cancel they finally had their expert work on it. Cons: Difficult to get to a technical support representative. It takes a while for them to answer my call. Pros: -It's very easy to use. Recently the sotfware changed a lot its appearance but it looks even better. Comments: Absolutely fabulous! This is my go to company for phone service. Pros: Ease of use for employees is the biggest pro. Very little cost on training. Pros: The system is easy to use and relatively maintenance free. When I first started using the system it was a bit glitchy and the voice quality wasn't great, but I have no such complaints anymore. I like the fact that the number travels with me where ever I am. Cons: The website and smartphone app need some updating and upgrades. The website appears to be based on old code and does not have the level of functionality and ease of use that we would expect from a tech company. The smartphone app, which I use on an android device, well, I just use Skype instead. Recommendations to other buyers: Overall, this is a good system with good value for the money. Pros: I have not complain about their service. One time setup and very stable. Good pricing. Cons: Old user admin portal. Can't cancel service or remove credit card from portal. Pros: I like the fact that this software allows me to access the phone functions across multiple devices. Cons: We have had connectivity issues with the software. Pros: I like that I can control the entire firm in one place.